It's an amazing fact, but it seems not a day goes by when I don't read on some webpage, forum or blog that Rock and Metal music in all its varied forms, is on its last legs, dying and that there are no new acts to discover or to stop this rot. What utter balls say I. I know for another fact that our Reviews Ed has to cut reviews out of each magazine because we just don't have the space for them, so when I read such stuff on the net, it makes my blood boil. 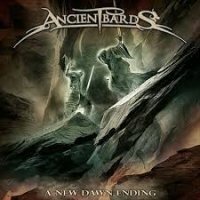 I mention this because whilst perusing various online music retail stores, I came across the new album by Ancient Bards entitled 'A New Dawn Ending' (their third to date). I liked the look of the name so gave them a Google (queue the Kenneth Williams impressions), watched a couple of videos and low and behold, a new band (to me anyway) came onto my Rock radar. Immediately the bands seamless blend of Symphonic Metal (which is comparable to the likes of Rhapsody, Epica (with far less growling) and Nightwish) had me hooked. Yet what really stood out for me was the talents of the band as a whole. Wonderful musicianship is combined with the outstanding vocals of the band's chanteuse Sara Squadrani and then all of this is blended together into over the top songs as can be found on '...Ending' and very quickly you find yourself listening to one of the best Symphonic bands working today. From the opening intro of 'Before The Storm' which melts into the powerful 'A Greater Purpose' (which the word overblown was coined for), to the heartfelt ballad 'In My Arms' on which Squadrani shows her true versatility by moving away from the vocal power of the Symphonic Diva and into a more dramatic, emotion filled performance that makes this song come to life (look for the video on YouTube). Beyond these tracks you continue to find a group of musicians playing many more incredible Rock songs, performed with a zeal and fervour that is both infectious and compelling. AB really do cover all musical bases and as this album played, I was stunned that I'd missed out on this wonderful band for so long. So if you're on the lookout for an act that plays captivating songs filled with killer musicianship, a vocalist to die for and a production that enhances all these elements to the Nth degree then you will find Ancient Bards have all this and more. I defy any Symphonic Metal/music fan not to like what they do. A wonderful album indeed.